AR & VR in Education - Going Beyond the Page! If a picture is worth a thousand words, what would an interactive picture be worth? What about an entire interactive world where you can learn, play, and experiment in a safe environment? Student engagement is not only a 21st century buzz word, it is an important step in getting students to take on the responsibility of their own learning. Engaging students is not a new issue but, thanks to technology, there are now new ways to bring more engaging content to students – one example is through AR and VR. These new technologies are allowing students to get inside the content and learn from a different perspective - giving them a better understanding. Initial research is showing much improved engagement from the student’s perspective. Join us for some ideas on using AR and VR to go beyond the page and improve your students' engagement. 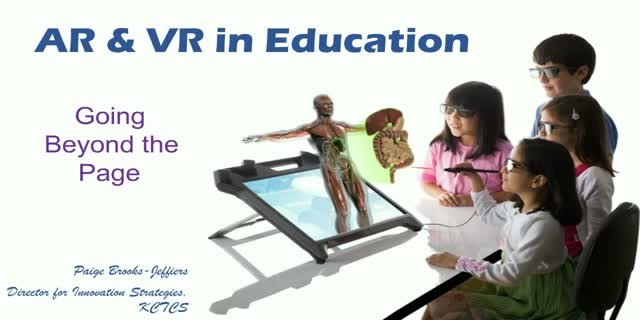 Title: AR & VR in Education - Going Beyond the Page!